The goal of this activity is to introduce students to the fascinating origins of familiar quotations which have become "household words." Activities will include using the Internet as an educational tool, using a search engine to locate famous quotations and meaningful words, creative writing and public speaking. VisitBartlett's Familiar Quotationswebsite. Become familiar with the features on the Homepage. Create a bookmark. Use the search tool to find Sophocles. Write out either quotation #7, #10 or #13.Use the Alphabetical Index of All Authors to find Elizabeth Browning. Write out quote #14. Use the search engine to find William Shakespeare. Complete the following famous quotation: "O Romeo, Romeo! Wherefore . Visit 2 authors of your choice. Use the search tool to find the word beauty . Select one of the sentences where the word is used and write it down. Use the search engine to find the word wisdom. Select one of the sentences where the word occurs and write it down. Use the search tool to find any 3 words of your choice. 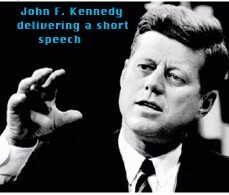 Write a short speech using a quotation and a word from your search. Practice reading your speech aloud with knowledgeable feeling. Tell what you plan to do the next time you visit this site. Rate the site on: Information - how much is there and how in depth is it? Appealing to the eye - color and graphics? Organization - how easy is the site to use and navigate? Student Handout for website visit. Short essay. Short speech. Evaluation. Student progress will be measured by teacher observation and evaluation of written work and oral presentations. The teacher will interact with the students as they work on their assignment and provide guidance and verbal feedback. Students are encouraged to work cooperatively in their teams and attempt to overcome problems and glitches that arise while progressing through their assignment . Students will be able to. . .
-Write to express ideas, record information, and communicate with others. -Use simple and compound sentences with few grammatical errors and experiment with complex sentences. -Spell common vocabulary words accurately. -Use skills in basic technology to facilitate writing and to aide in communication. Materials Needed:1. Computer lab with Internet access or groups of 4-5 computers in classroom setting. 2. Teacher generated off-line worksheets.